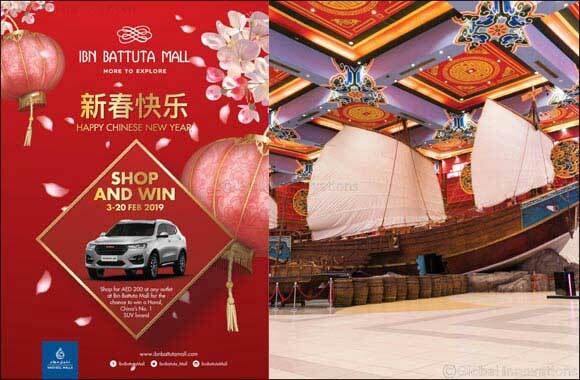 Dubai, 30 January 2019: Ibn Battuta Mall is celebrating Chinese New Year with an exciting Shop & Win promotion that will see one lucky winner drive home in a brand new Haval H6 top-of-range sports utility vehicle (SUV). Customers can enter the draw by spending AED200 or more at any outlet at Ibn Battuta Mall from 3 to 20 February, and submitting their receipts at the customer care desks at China Court and Tunisia Court. Eligible candidates then register their details to receive digital coupons via text messages that automatically enter them into the raffle draw for the Haval H6 SUV. Held in collaboration with Haval – China’s No. 1 SUV brand – the promotion highlights the traditional festival that is symbolic of prosperity and new beginnings.